Fourth-graders celebrate regions of theU.S. Abov e, Addie Althoff poses as Jackie Kennedy. At left, Lindy Mueller performs a solo as Albert Einstein. 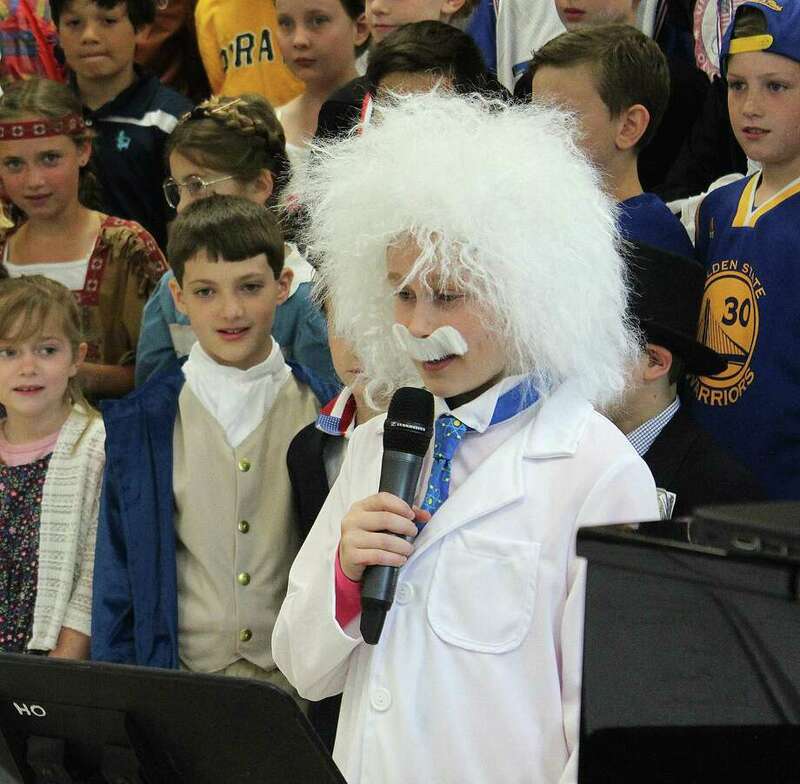 Of course, these historical figures weren’t actually at Holmes School on May 26, but all the fourth-graders dressed up as different icons of their choice as part of their annual celebration of different United States regions they have studied throughout the year. This year was the first year students did a “living museum” as part of their celebration. Each student chose a different influential figure, living or dead, and dressed as them. After the concert, visitors met the figures and learned more about them through student presentations and poster boards, focusing on how that person impacted a certain region of the United States. Fourth-grade teacher Dawn Taranto said the decision to do the museum this year stemmed from the students’ interest in biographies. “They took it to a level I didn’t know they were going to,” she said. The students represented a variety of figures, some historical and others more contemporary. They represented a range of fields, from entertainment to sports and writing. Visitors were given a clipboard with a scavenger hunt to find certain figures as they weaved through the likes of people like Bruno Mars and Shirley Temple. Addie Althoff, 10, decided to study Jackie Kennedy at the suggestion of her mom. Not only was Kennedy related to the White House, which Addie wanted, but she has some things in common with the fourth-grader, such as a love of horses and fashion. Other students chose figures whose work had a more personal impact on their lives. Charlotte Ruhe, 10, chose to portray the musical composer Lin-Manuel Miranda, creator of the Broadway smash hit, “Hamilton.” Her twin sister portrayed Alexander Hamilton, the inspiration behind the musical. Erik Huss, 10, also decided to portray one of his favorite creative minds. Using wire-rimmed glasses and some face paint, he transformed himself into filmmaker George Lucas. Through the project, he was able to learn more about Lucas’ work and what led him to become a filmmaker. The students brought in characters’ favorite foods or food from their region, something that has been done in previous years.